Why Should Malaysia Hire Social Media Consultants For Their Business? Is Social Media Consultant For Small Business In Malaysia Worth Hiring? Allow me to start by saying that hiring social media consultant for small business in Malaysia is an excellent way to elevate your business regarding visibility, growth and ultimately sales. With the help of social media consultant, you can easily save more time to focus on things that matter most to your business, instead of spending an enormous amount of time trying to hack social media marketing. What are social media consultants? Why hire a social media consultant? In this article, we’re going to go through in detail on both, and I sincerely hope that you will find this article useful. Also, I would appreciate it if you could forward this article to your colleagues or bosses for their reading too! A social media consultant is often a person you are (literally) hiring to capture your vision, hopes, and dreams for your business through digital platforms. With the current technology advancement we are having, being visible socially isn’t a luxury anymore; it is now a necessity especially when you are looking for growth in the small business industry. Typically, social media consultant or consultants can consist of a single person or a group of consultants. Often, you will be working very closely with them, and they will provide actionable strategies for you and your company to grow and explore new opportunities or changes. Of course, the strategies shared are often within the social media scope and will well be effective for all brick and mortar, brick and online, and solely online businesses in Malaysia. As small businesses usually don’t have a large budget for hiring a branding consultant, hiring a social media consultant would be much easier on your budget, as well as getting your brand on the right step. Why hire a social media consultant for small business? We understand the power of online visibility in the country and therefore, hiring a social media consultant for small business in Malaysia would be an excellent choice for most businesses. As much as you think you can do it all, sometimes you need to know when to step outside of your comfort zone and hire a consultant. Thankfully in Malaysia itself, you can find many consultants in various industries such as branding, digital marketing, search engine, content management, and social media management. Now, here’s a very serious concern that every small business in Malaysia is concerned of. People associate the term “consultants” with big advertising campaigns, something unaffordable, and not for their small business. And this is where business owners don’t see the bigger picture. Hiring social media consultant for small business in Malaysia will improve their overall business stand in the market while getting actionable advice from the consultants who are extremely experienced with the industry. Plus, not all social media consultants for small business in Malaysia charge a large sum of fees. The vision and mission of Marketing Lancers are to provide excellent social media consultations for small business in Malaysia at very affordable prices. On average, our consultation fees starts from RM 300 per month and are extremely flexible based on your specific company needs. So what are the most common mistakes done by small businesses when trying take on social media marketing? “Thinking that social media marketing is relatively easy.” The truth is social media is often seen as ‘easy’ on the outer side. Choosing the right social media platform: There are so many social media platforms in today’s world. The right choice will grow your business and choose the wrong one will just waste your time and money. Non-paid advertising: Do you know that only 10% of your entire Facebook Business Page followers see your posts on a daily basis? And 10% is just the best result. Usually, the industry benchmark is around 2%. So, this leads us to the next concern. Social media algorithm: What being seen by your fans and followers are affected by the social media algorithm within the platform. This means that whatever they do, click or read will affect the chances of your post being visible to them. Hiring social media consultant for small business can easily solve this challenge as he or she will have the expertise to help you beat the algorithm and make your business stand out socially. Paid advertising: I’ve seen small businesses doing their paid advertising on social simply because they wanted to save money on consultancy and make no mistake, I understand it completely! When I ask them for the results, they said the results are often moderate (or low) number of reach and pretty much doesn’t affect their business growth in any segments! This happens because most small business owners believe that paid advertising is as easy as choosing your audience, set up some image and put on your credit card. The truth it, it is more than that! 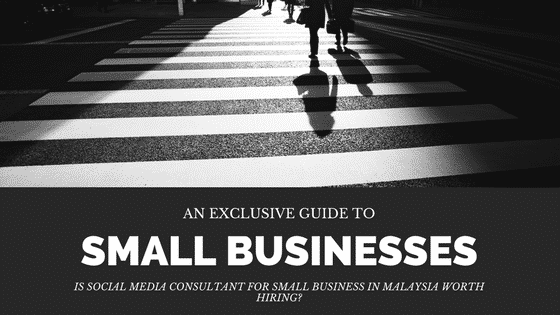 The million dollar question: Is social media consultant for small business in Malaysia worth hiring? As much as I want to say “Yes, yes and hell yes,” the real answer is it depends on. It depends simply because no two businesses are alike. Wait, what are you talking about, Reginald? What I mean that most small business owners do not understand if they need a social media consultant for their business. That’s why Marketing Lancers offer free consultancy for all startups and small businesses to ensure that they understand what social media marketing could do for them. Call us stupid, but we hate getting paid but NOT doing the job which is intended to! Still undecided if you should hire social media consultant for your business? Click here to talk to us today for free consultation. We will walk you through the entire process while ensuring that you know exactly what you need for your business.